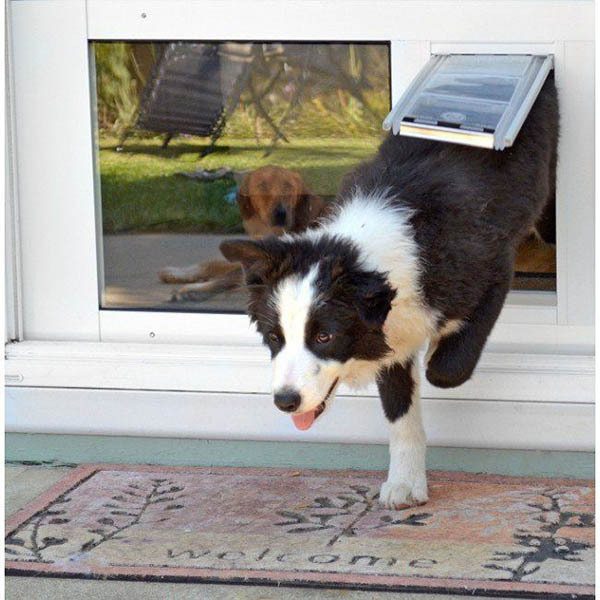 The Thermo Panel 2e Microchip Patio Panel Pet Door is a fusion of the Endura Flap Thermo Panel TM IIIe Dual-Pane, Low 'e' Glass Patio Pet Door together with a superb Sureflap Microchip Pet Door. Height Adjustment Range Choose an option74 3/4 in. - 77 3/4 in.77 1/4 in. - 80 1/4 in.93 1/4 in. - 96 1/4 in. Includes a “4-way” locking mechanism that gives you the option of locked, unlocked, in-only, or out-only. It also incorporates a timer feature that you can program to activate any of these settings at any time. Easy installation due to the spring loaded top. To install your Endura Flap, place the bottom of your panel into the bottom track, push the spring loaded top down, align it to the top of your sliding glass door frame, slowly release the spring loaded top to fit into your tracks and twist the thumbscrews to lock it into place. Want to Customize Your Sliding Glass Cat Door? Frosted Glass Option: Your panel may be special ordered with frosted (bathroom) glass to give you extra privacy. This also allows you to partially open your drapes to access the pet door without losing privacy. Frosted glass panels are final sale, no returns, and requires an extra 3-4 weeks to custom order the glass. 74 3/4 in. – 77 3/4 in., 74 3/4 in. – 77 3/4 in., 77 1/4 in. – 80 1/4 in., 93 1/4 in. – 96 1/4 in.